Lord Cornwallis surrenders to George Washington at Yorktown, Virginia, October 17, 1781. Painting by John Trumbull. This week we commemorate, and bring to your attention, the Battle of Yorktown, the battle of the American War of Independence which resulted in the surrender of Britain's General Lord Cornwallis to America's General George Washington in Yorktown, Virginia, on October 17, 1781. This victory effectively decided the War of Independence, and should be far better remembered than it is today. The major point to be made, hearkens back to the reasons for that war. Too many of our citizens, and even our leaders, have forgotten just what forced the founders of our nation to take up arms against Great Britain: the fundamental conflict between the oligarchical and republican systems. This is obvious from the many references made today to the alleged alliance among "English-speaking" peoples. This loss of understanding is painfully evident at the site where Yorktown is commemorated today, which features a plaque, signed by President Ronald Reagan, pledging eternal friendship between the United States and Great Britain, as proceeding from that date. What an atrocity! Yorktown did not clear the decks for future friendship between America and Great Britain. Rather, the British monarchy maintained efforts up through the Civil War, to prevent the coalescence of the United States, and/or to break the nation into parts— through various secession plots, the War of 1812, and the Civil War itself. In addition to the physical assaults, the British, to this day, abhor the republican principles upon which the United States of America is based. The British surrender at Yorktown did not end the War of Independence, either. Despite the fact that the French Navy's joint deployment with the American and French troops had decisively defeated the main force of the British Army, other sections of the Army continued to fight, and negotiations for a final treaty dragged on until 1783. Yet, strategically, the war was wrapped up at Yorktown. Cornwallis had established a fort there, and knew he was surrounded by American and French forces. He sent word for reinforcements from the British Navy in New York, but they never came. The French fleet, led by Admirals de Grasse and de Barras, effectively blocked a British approach by sea, and any possible attempt by the British to escape. A siege by land and sea forced Cornwallis to decide to surrender, before he was overrun. 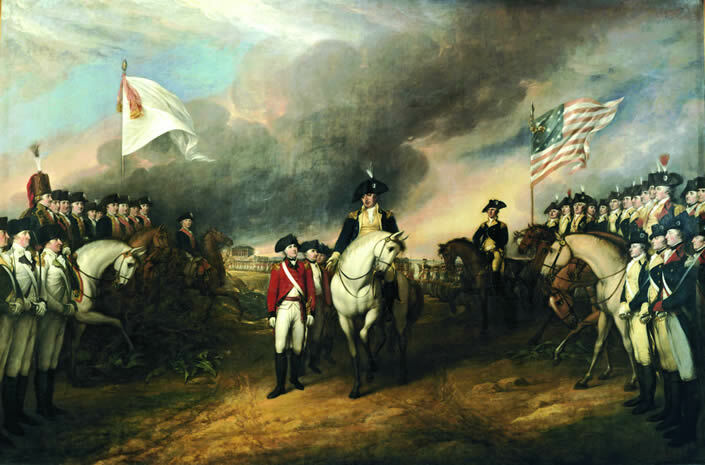 The actual surrender itself is depicted in the famous painting by John Trumbull pictured here. But it was not straightforward. Having sent a message to Gen. Washington that they were ready to surrender, the British were not very happy. They, and the Germans fighting with them, had to be forced from their fort, and forced to bring their colors with them. The British played "The World Turned Upside Down," a popular song of the time, to express their view of events. Meanwhile, Gen. Cornwallis stayed inside, claiming sickness. He sent out his second in command, Gen. O'Hara, to surrender. But O'Hara initially tried to surrender to the French, not the Americans! The French refused to accept this intentional slight against the sovereignty of the United States. General Washington, equally conscious of the need to assert the dignity of the new nation, then refused to accept Cornwallis's sword from O'Hara. He instead made O'Hara, number two, surrender the sword to the American second in command, Gen. Benjamin Lincoln. In London, the significance of the defeat of Cornwallis was well understood, and negotiations toward a peace began.